Incredible Adventures is the only non-Russian company authorized to arrange MiG flights in Russia. 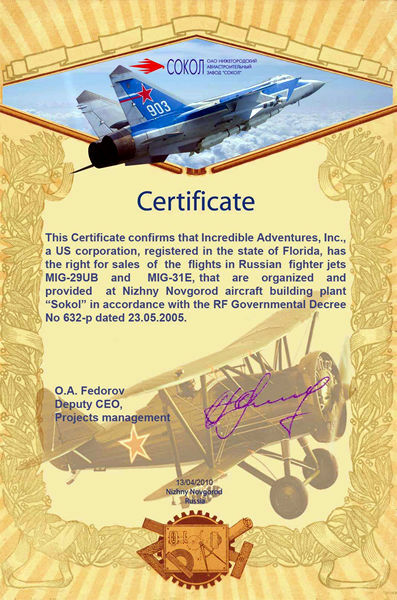 "This Certificate confirms that Incredible Adventures, Inc., a US corporation, registered in the state of Florida, has the right for sales of the flights in Russian fighter jets MIG-29UB and MIG-31E, that are organized and provided at Nizhny Novgorod airdraft building plant "Sokol" in accordance with the RF Government Decree No 632-p dated 23.05.2005"
We're an American company registered in the State of Florida with an office in Moscow. Complete credentials and references upon request. Copyright 2019 Incredible Adventures. All Rights Reserved.